Grammy Award-winning David Ball is the sole surviving member of the Austin/Carolina country-jazz trio (and Lyle Lovett favorite) Uncle Walt’s Band. 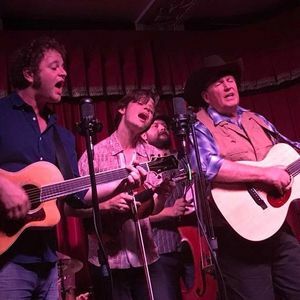 Here, he teams up with Austin violinist Warren Hood—son of Uncle Walt’s Band fiddler Champ Hood—and Warren’s cousin, Marshall, for a project paying tribute to that unforgettable music: Uncle Walt’s Band Album Release. Guaranteed to be a night that brings back fond memories of the late, great Walter Hyatt, Ball will also play songs from his solo career, adapted to the acoustic trio style.